It is quite exciting to present my diabetic friendly lunch , breakfast and dinner series. Primarily because I need to be extra cautious and make sure its completely healthy. In that way, I also stay healthy with these ideas. All my diabetic friendly recipes are self tested and hence anyone with medication can try this safely too. 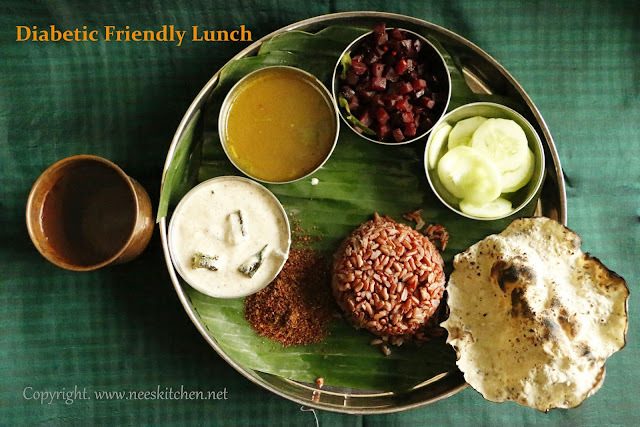 Today's recipe has Vepampoo Podi (Neem Flower Powder), Pachai Mor Kulambu (Raw buttermilk stew), Vaazaithandu rasam (Banana stem rasam) , beetroot stir fry, sliced cucumber, roasted papad and a cup of red rice. The meal also comes with a cup of water in a copper cup overnight. Red rice is cooked with 1 cup of rice and 2 cups of water in electric cooker. I have not tried pressure cooker. This is one of the easiest meal for me to prepare on a working day. 1. Soak a cup of water overnight in a copper cup. 2. Red rice is cooked in electric cooker, hence I put that first in the cooker. Since it is cooked in electric cooker, it did not need any specific soaking time. 3. The pachai mor kulambu powder was ready with me as I prepared over the weekend. Hence I just fried the ladies finger and mixed it with the powder ,yogurt and garnished it. 4. Neem flower powder (Vepampoo Podi) was ready in stock. 5. The main work was the vaazaithandu rasam(Plantain stem). However since it is going to be blended as a juice I saved the time which is need to remove its fiber. 6. Beet root stir fry is a simple stir fry with mustard and cumin seeds as tadka. I have not added this recipe in the blog as its quite common in the internet. 7. The rest like cucumber slices and papad are just few minutes work. Disclaimer: All my diabetic friendly recipes are self tested and hence anyone with medication can try this safely too.